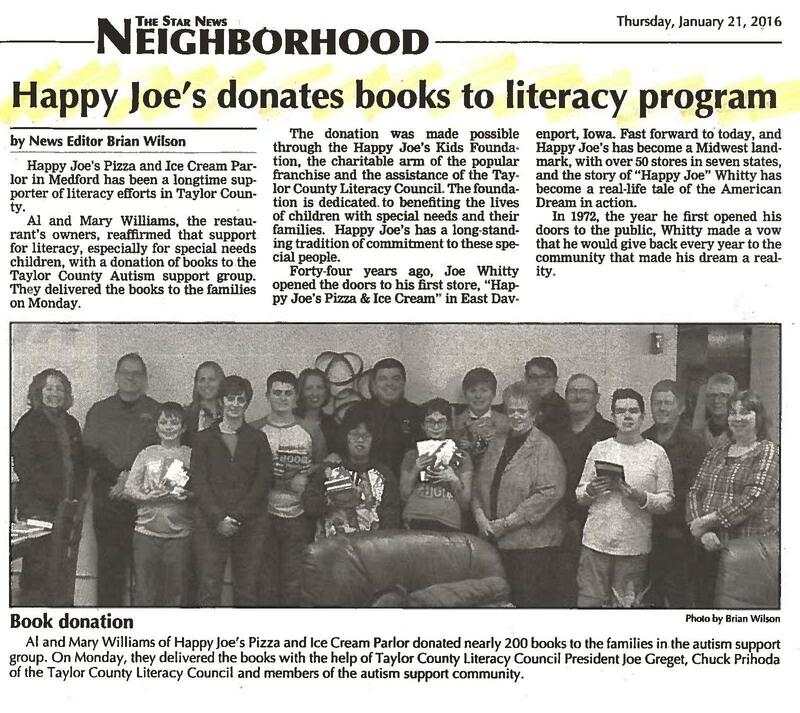 Happy Joe’s Kids Foundation and BAM donated books to area organizations. Watch and see the excitement. In addition to delivering heart-shaped Valentine’s Day pizzas this week, Happy Joe’s is also delivering something wonderful for some young book-lovers in the community. The Happy Joe’s Kids Foundation is dedicated to benefiting and improving the lives of children with special needs and their families. Happy Joe’s has a long-standing tradition of commitment to these special people. Happy Joe’s teamed up with Books-A-Million during the holidays and invited the community to donate books that would be placed into the hands of children and adults with special needs. Books-A-Million collected over 1,000 books and Happy Joe’s delivered some of those books into grateful hands today. Katey Wulf, manager of the Davenport BAM!, said, “The Happy Joe’s Kids Foundation is a great organization and we plan to be part of it every year. We like to do a book drive each November through December to support their mission and offer our community a way to give back.” The Happy Joe’s Kids Foundation is a national foundation. To learn more or to make a donation, go to www.happyjoeskids.org. April 24, 2012 – Bettendorf, Iowa-based Happy Joe’s Kids Foundation announced its initial list of summer events in the Quad Cities it will be supporting as part of its efforts to raise awareness and support for children with special needs. Look for Happy the Dog and the Happy Joe’s Dancers at each of these events and pick up information on how you can support the special needs of area children through the Happy Joe’s Kids Foundation.